A new program aims to help companies based on University of Minnesota research succeed in bringing discoveries beyond the lab and into the marketplace. The Discovery Launchpad is a startup incubator developed by the Venture Center, part of U of M Technology Commercialization, to provide expert coaching and support for researchers interested in forming a startup company to commercialize new technology. The program builds off of the broad network of resources already available across the U—such as MIN-Corps, MN-REACH, and the Business Advisory Group—that focus on early-stage support for technology development, said Russ Straate, associate director of the Venture Center. The two-year program starts with an assessment, where the company founders, including the researchers, meet with Discovery Launchpad advisors to discuss their discoveries and create a customized work plan. Startups that qualify for the program will then receive a formal invitation to participate. The next phase involves creating business, marketing, and sales plans, as well as working on financial management and developing a business pitch. Advisors coach participants through this process, which can take several months depending on the leader's skillset and previous business experience, and the Venture Center provides them with shared office space. When this phase is finished, the startup officially launches, and continues to receive advising and support for the remainder of the two-year term. The Venture Center is currently working with eight startups, and plans to graduate eight from the program this fiscal year. Researchers interested in participating in the program are invited to attend the upcoming open house on March 12. Among the first startups to use the Discovery Launchpad was NovoClade, a synthetic biology company founded by a team of researchers from the College of Biological Sciences and College of Food, Agricultural, and Natural Resource Sciences: Siba Das, Ph.D., senior research scientist at the BioTechnology Institute (BTI) and the Minnesota Aquatic Invasive Species Research Center; Maciej Maselko, Ph.D., previously a postdoctoral scholar at BTI and now a lecturer at Australia’s Macquarie University; Michael Smanski, Ph.D., assistant professor of biochemistry; and Perry Hackett, Ph.D, professor of genetics, cell biology, and development. Das, who is also NovoClade’s president and CEO, said the program helped him become better versed with business concepts, such as financial models and investment rounds, relevant to his startup. NovoClade, a winner of the recent winter 2018 Walleye Tank business pitch competition, aims to control mosquito populations and their role in spreading disease using gene editing technology that creates a line of “sterile” mosquitoes. In the wild, only male mosquitoes survive from the eggs of the modified mosquitoes. When these male mosquitoes mate with their wild counterparts, the eggs will produce sterile, male-only offspring—and because only female mosquitoes bite humans, this limits the number of insects around to transmit diseases. Unlike existing insect management efforts, which rely on toxic chemicals and are not species-specific, genetically editing mosquitoes allows scientists to remove only the disease-carrying insects from the population, while sparing other species from any harmful effects. Directing the Discovery Launchpad program are Mary MacCarthy, venture program manager, and Joel Cannon, Discovery Launchpad program leader. In addition, the program has five external advisors who will coach participants through the process of launching a startup company based on University research. A UW-Madison lecturer in entrepreneurship, Bock co-founded and has been CEO or chief financial officer for four life science companies spun out of university research. He has negotiated license agreements, raised capital, and initiated commercial activities at each startup before turning them over to professional management. Bock raised more than $50 million in private equity and achieved more than $200 million in exit/acquisition value. He has also managed multiple angel investing networks, facilitating more than $10 million into early-stage technology firms. Dennis has 35 years of experience in technology assessment, licensing, partnering, acquisitions, and R&D. As a vice president in Medtronic’s $5 billion Cardiac Rhythm business, he led startup and new technology evaluation, investment and acquisition, external R&D partnerships, and licensing. Before Medtronic, Dennis created a new licensing business at 3M and helped create the $2 billion spin-out of Imation. At Imation, he turned the Specialty Data Storage operation from a $40 million money-losing business into a $60 million profitable one in 10 months. Prior to these business roles, Dennis practiced IP law for 15 years in private practice at John Deere and 3M. King has more than 20 years of financial and management experience across many industries. He was a certified public accountant for RSM McGladrey and then moved into industry-leading, high-growth organizations as chief financial officer, including Cannon Technologies (acquired by Eaton Corp.). King was also chief financial officer of two startups from pre-revenue to commercialization in the energy and consumer electronics sectors, during which he focused on business development, financing, and capital planning. He has been a business partner in four startups in energy solutions, software, ed-tech, and consumer products. Sewall specializes in the assessment of new technology for prospective investors and creates strategic product road maps and timelines for emerging health care technologies. She was a judge for MN Cup and a member of the External Review Board for MN-REACH at the University of Minnesota. Sewall also led development and commercialization of products that advanced infusion therapy, intraoperative care, critical care medicine, and chronic and home care. Wilson, a contract chief financial officer, began her career in public accounting at Ernst & Young and then worked for Cargill in its Leasing Company and Treasury Department. She started a consulting firm and has worked with over 40 companies ranging in size from startups with just one employee to multi-million-dollar companies. Wilson currently leads startups in financial management, organizational processes, and strategic planning. 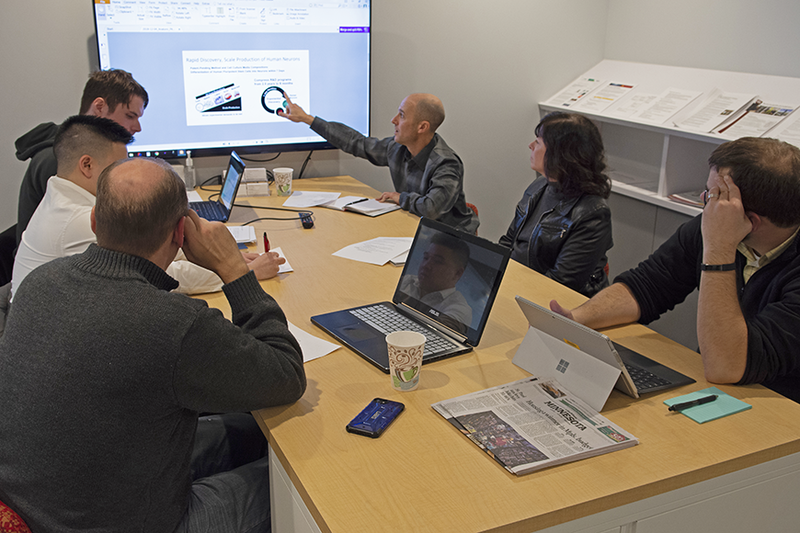 Interested in learning more about the University’s new startup incubator? U of M research faculty and staff are invited to attend the Discovery Launchpad Open House, hosted by the Venture Center on March 12 from 5 to 7 p.m on McNamara Alumni Center’s second floor. The event will feature a fireside chat followed by Q&A with faculty Dan Knights, Kenny Beckman, and Daryl Gohl—the three founders of U of M microbiome analysis startup CoreBiome—who will share their startup experiences ranging from the launch of their company in 2017 to its acquisition by OraSure Technologies Inc. earlier this month. Attendees will also learn how the Discovery Launchpad supports researchers, meet the program’s advisors, and enjoy appetizers and networking opportunities. Learn more about the Discovery Launchpad Open House or contact venture@umn.edu with questions. Last Modified: January 29, 2019 - 10:37am.